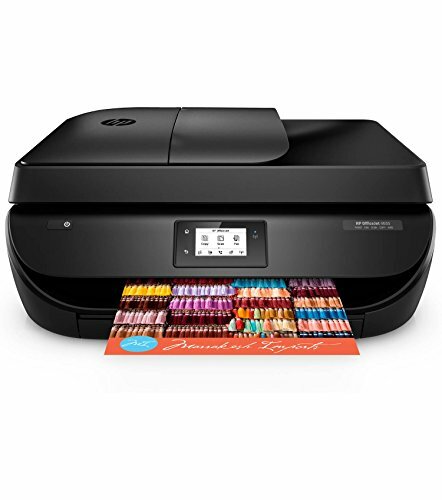 Reasons Why You Should Consider the HP OfficeJet 4655 All-in-One Printer (Certified Refurbished)Designed to help you be creative, stay productive and save time, the HP OfficeJet 4655 wireless all-in-one is well suited for both home and office use.Printer SpecsCopy, scan, automatic two-sided, and wireless printing.Technology: HP Thermal Inkjet.Print speed: Black (ISO): Up to 9.5 ppm; Color (ISO): Up to 6.8 ppm First Page Out Black: As fast as 18 sec; First Page Out Color: As fast as 22 sec; Black (Draft): Up to 22 ppm; Color (Draft): Up to 21 ppm. Duty cycle: Monthly, letter: Up to 1000 pagesInnovation: The HP ENVY 7855 prints borderless photos right to the edge of the paper. Product dimensions (W x D x H): Minimum: 18.26 x 15.35 x 9.0 in; Maximum: 18.26 x 20.39 x 9.0 inSupported paper sizes: Letter, legal, 4x6 in, 5x7 in, 8x10 in, No. 10 envelopes.Display: Manage your print, copy and scan jobs directly from your ENVY 7855 with the built-in 2.65-inch color IR Wi-Fi, LED touchscreen.What's in the box: HP ENVY 7855 e-All-in-One, HP 62 Black Ink Cartridge, HP 62 Tri-color Ink Cartridge, Power cord.About Refurbished PrintersThis Certified Refurbished product has been tested and certified to work and look like new, with minimal to no signs of wear, by a specialized third-party approved seller. The product is backed by a 90-day warranty, and may arrive in a generic brown box. 90 Day Limited WarrantyThis product is covered by a minimum 90 day repair/replacement warranty. Specific warranty information and how to submit a warranty claim is included with your product. Printer type: All-in-one wireless printer. Main functions of the HP ENVY 5660 all-in-one printer include copying, scanning, automatic two-sided, and wireless printing. Take charge of your tasks with the easy-to-use 2.2-inch (5.5 cm) displaysimply touch and go.